4,486 American Soldiers Have Died in Iraq. President Obama Is Continuing a Pointless and Deadly Quagmire. I recently wrote a satirical article highlighting my view that if taxes and military service were required during every American military engagement, we'd never again wage wars with such ease and impulsiveness. Contrary to the erroneous and ridiculous interpretation of one website that claimed I believe "we're a nation of selfish sloths" (thanks for bothering to read my other articles before the knee-jerk reaction), the fact is that I believe we're a great nation, but one that is too emotionally inclined to justify military action from a terrorist video, or send other Americans off to counterinsurgency wars without realizing the full costs of such endeavors. To be clear, there is no satire in this post and these thoughts, as with all my writing, are my own; I'd never speak for anyone else and certainly not the men and women in uniform who protect this country and who've died in the Iraq War. Over the last several years, we have consistently taken the fight to terrorists who threaten our country ... We've done so while bringing more than 140,000 American troops home from Iraq, and drawing down our forces in Afghanistan, where our combat mission will end later this year. Thanks to our military and counterterrorism professionals, America is safer. Still, we continue to face a terrorist threat. ...Our objective is clear: We will degrade, and ultimately destroy, ISIL through a comprehensive and sustained counterterrorism strategy. ... Now, it will take time to eradicate a cancer like ISIL. And any time we take military action, there are risks involved -- especially to the servicemen and women who carry out these missions. But I want the American people to understand how this effort will be different from the wars in Iraq and Afghanistan. It will not involve American combat troops fighting on foreign soil. ... May God bless our troops, and may God bless the United States of America. 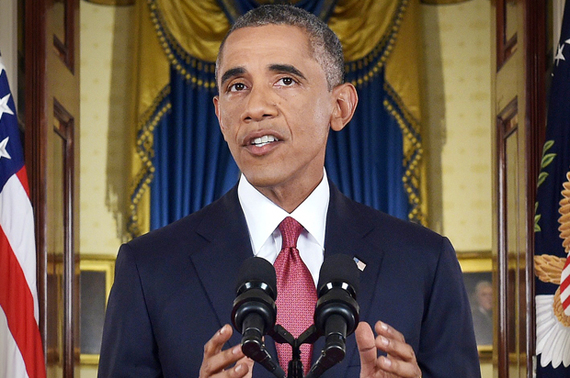 First, there were a number of inaccurate statements in President Obama's speech. We already have "American combat troops fighting on foreign soil" as evident by the over 1,600 American military advisers recently sent to Iraq to help the Iraqis fight ISIS. Furthermore, General Martin Dempsey has already stated that American boots on the ground is a very real possibility, directly contradicting the President's speech. Second, all airstrikes are planned with the theoretical or imminent possibility of ground troops. Most importantly, the phrase "it will take time to eradicate a cancer like ISIL" is a lie through omission; we've already spent over ten years in Iraq and "terror" hasn't been destroyed. Once al-Qaeda Iraq was defeated, ISIL took its place. To pretend that another group won't replace ISIL once ISIL is defeated, through another decade of war in Iraq, perhaps, is simply playing a dangerous game of semantics. Also, the president states ISIL will be destroyed "through a comprehensive and sustained counterterrorism strategy" but fails to mention we've already had that strategy in Iraq and Afghanistan. The COIN strategies of General McChrystal in Afghanistan and General Patraeus in Iraq did everything possible to ensure that terrorist groups were defeated, yet the Taliban exists in Afghanistan and ISIS now terrorizes Iraq. Obama's words ignore the reality that like a hydra, terror groups transform into new organizations once defeated and continue to engage in asymmetric warfare aimed at weakening infinitely more powerful armies. Of course ISIS can't defeat the U.S. militarily, but the point is what happens once it is defeated and Americans must still drive down roads filled with IED's and occupy cities to ensure that new threats don't resurface? Thus far, the Iraq War has been the definition of a quagmire where the more energy spent trying to quell sectarian violence, terrorism, and bloodshed, the more each of these horrors continue to rear their ugly heads. It would be nice if President Obama had mentioned the sacrifice of soldiers and their families (just my opinion, not speaking on anyone else's behalf) and stated the ongoing VA crisis that our media and Congress have seemingly forgotten. After 4,486 U.S. soldiers died in Iraq and 2,345 U.S. soldiers died in Afghanistan, 1 million U.S. soldiers wounded in both wars, and a potential cost of up to $6 trillion, a new group like ISIL now causes havoc in the Middle East. What's the point of fighting endless war against terrorists when all this sacrifice simply leads to new terrorist threats? "Both wars were won, and we didn't know enough to go home" after about six months, Bolger argues. ... "Don't be so arrogant and think you're going to reshape the Middle East," Bolger says. "We've basically installed authoritarian dictators." ... "They should have been limited incursions and [then] pull out -- basically like Desert Storm," he adds, referring to the 1991 Gulf War that forced Saddam Hussein's forces out of neighboring Kuwait after an air campaign and 100-hour ground war. The U.S. wasn't up to perpetual war, even post-9/11. "This enemy wasn't amenable to the type of war we're good at fighting, which is a Desert Storm or a Kosovo." Bolger said his views on the wars grew more sour during his three tours. "My guilt is not having earlier figured out what was going wrong, and making a more forceful case and working with my peer generals to make a better military recommendation," he says. "What eats at me the most is the 80 dead people I had in my command over my three tours, that eats at me a hell of a lot." "Some say the Iraq surge of 2007 proved counterinsurgency tactics worked. Others point out that today's Iraq is a sectarian mess, undermining that belief. As for the Afghan surge of 2010-11, well, who knows? We cannot even say, or will not even say, who won these campaigns. It sure does not seem to be us..."
General Bolger's words are eloquent, blunt, and come from a leader of American troops in Iraq. Yes, ISIS is evil and should be destroyed, but it's the job of Iraqis (Iraq's 250,000 troops, Kurdish forces, Shia and Sunni who hate ISIS, and others) to defeat this threat to their country. As stated by General Bolger, the U.S. does well in short, limited wars with a clear military goal and objective. Once things turn into an endless fight, then the enemy isn't "amenable to the type of war we're good at fighting." As for his experience and firsthand knowledge, General Bolger explains, "I commanded a one-star advisory team in Iraq in 2005-06, an Army division (about 20,000 soldiers) in Baghdad in 2009-10, and a three-star advisory organization in Afghanistan in 2011-13." Therefore, it's safe to say he knows Iraq and the lessons President Obama has recently ignored. Finally, General Martin Dempsey's recent statements about American ground troops possibly being deployed in the future is not only an honest assessment, but also a consequence of increased airstrikes. The one thing that Vietnam should have taught President Obama and his administration is that no amount of bombing can dislodge a guerrilla force within a foreign territory. Therefore, the real truth is that not one more American should be added to the 4,486 who've already died in Iraq, or the one million Americans injured out of the 2.5 million Americans who've served in both wars (the VA stopped listing "non-fatal" war injuries to the public so official figures are less than one million). Iraqis, with arms and funding from the West, should fight ISIS, and America should remember lessons learned just several years ago from the Iraq War. President Obama has unfortunately succumbed to the belief that "don't do stupid stuff" isn't a good foreign policy. Thus he's altered the philosophy that got him elected and is now implementing a costly, deadly, and unwise foreign policy with a new war in Iraq.